Great image. Congratulations on being Featured. congrats, where is this amazing waterfall? Fantastic waterfall view, great composition. Congrats on the feature. Awesome shot! Congratulations on being featured. WOOW! most aaahmazing!!! :):) HUGE congrats!! The figure at the bottom!!! Awesome....totally awesome. Great capture! Love the sheer magnitude of the falls in comparison to the figure in the foreground. Absolutely fantastic shot. So much power in those falls and the person just enhances the size and ferocity. Big congratulations on the feature. Stunning shot! Congratulations on your Feature! Great composition. Very powerful image. Looks bigger than I remember. Majestic shot. Congrats. Wow. When I went, there wasn't this much water! The inclusion of the figure is perfect as it really gives incredible scale. Spectacular...congratulations on contest finalist win. Incredible i fall in love.Congratulations! Wow,. Amazing Photo, I can't stop looking at it! Excellent shot, great mood and composition !! Congrats !!! 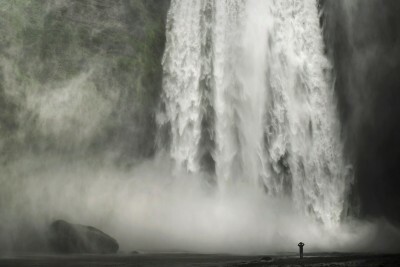 Skogafoss in all its ferocious beauty. You should have visited it in sring to have THAT volume of water falling down! Powerful shot.